Most people know that they should use sunscreen to reduce the risk of skin cancer and premature skin aging, but there’s an SPF-enhancing sidekick that’s often overlooked—ANTIOXIDANTS. We reveal the science behind how antioxidants boost your sunscreen’s effectiveness + tips to keep skin looking young, healthy, and vibrant. As great as broad-spectrum sunscreen is, it doesn’t offer 100% protection from the harmful rays we encounter daily. For example, a sunscreen with SPF 15 keeps out approximately 93% of bad ultraviolet (UV) rays, SPF 30 equates to 97% protection, and SPF 50+ garners about 98%. Another factor is that most people don’t apply (or reapply) sunscreen as liberally as they should to get sufficient protection. The residual UV exposure from the rays that get through can trigger free-radical damage that accelerates skin aging, in the form of wrinkles, dark spots, loss of firmness, and other issues. Even if you can’t see or feel the damage, it’s happening, albeit at a deeper level, and the results will show up over time. This doesn’t mean sunscreen isn’t effective or worth using—it absolutely helps protect skin from sun damage—but even superheroes need a little help every now and then. Antioxidants can help compensate for sunscreen’s inherent shortcomings (and for human error in application) by neutralizing the free-radical damage that sun exposure causes. They literally play a defensive role by diffusing the effects of the bad rays that make it through your sunscreen. 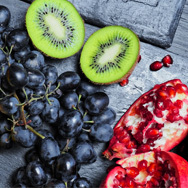 Not only that, antioxidants also help defend skin from other sources of free radicals, such as high-energy visible (HEV) light and blue light from your cell phone. Left unchecked, this damage can lead to skin problems no one wants. Many antioxidants also have skin-calming properties (environmental exposure stresses skin) and play a formulary role by helping to stabilize the sunscreen while also boosting its effectiveness. Simply put: Antioxidants supercharge your sunscreen by ensuring maximum protection and supplemental repair for your skin. The easiest way to get improved environmental protection is to apply a sunscreen infused with antioxidants every morning. You can also use an antioxidant serum before applying your sunscreen. (Sunscreen should always be your last skincare step in the AM.) When it comes to topical application of antioxidants, skin can’t get enough, so don’t worry about overdoing it. Additionally, consider applying a moisturizer loaded with antioxidants at night to help further repair signs of sun damage from rays that may have gotten through. All of the above will help provide a synergistic defense and help your skin stay supple, healthy, even-toned, and vibrant. Keep in mind, however, that this is only the tip of the iceberg for SPF-boosting antioxidants—the more, the merrier.